Important Water Hearings Monday & Tuesday! WHEN: Monday, June 28, 2010 at 7:00 p.m. in the Monterey City Hall Council Chambers (580 Pacific St., Monterey) and Tuesday, June 29, 2010 at 1:30 p.m. & 5:00 p.m. at the Oldemeyer Center (968 Hilby Ave., Seaside). 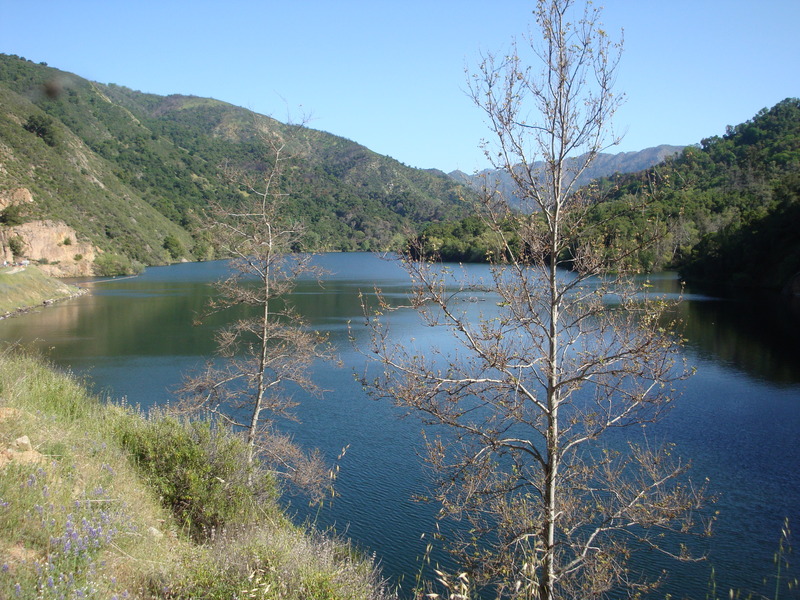 The reservoir impounded by the Los Padres Dam: The Regional Water Project is intended to replace water being illegally pumped from the Carmel River by Cal-Am, but the agreement controlling the Regional Project, as currently written, will not only rip-off the Cal-Am ratepayers and leave them without a say in how the Project is run, but could easily result in the Project failing to deliver enough water to offset the illegal diversions. The PUC can easily fix these problems, but they need to hear from the Cal-Am ratepayers that the community wants the problems fixed. The PUC’s record of doing the right thing on their own isn’t too good. If you’re a Cal-Am customer, you owe it to yourself to attend one of the Public Participation Hearings. It’s going to be your last best chance to get a more equitable arrangement for running the Regional Water Project (AKA the Marina Desal Plant) put in place. Under the current agreement, the Marina Coast Water District will pay only $148 per acre foot, no matter how much desalting the water actually ends up costing. The real cost will probably be about $5,000 per acre foot (according to the PUC’s Division of Ratepayer Advocates – it could go much higher). At $5,000 per acre foot, the Cal-Am ratepayers would be paying about 97% of the cost of desalting water for people and developments being served by the Marina Coast Water District. Since Marina Coast expects to receive 1,700 acre feet annually from the project, the cost of desalting this water, based on a $5,000 per acre foot cost, will be about $8.5 million per year – with about $8.25 million paid by the Cal-Am ratepayers. This is a rip-off, pure and simple. There is no possible justification for asking Cal-Am ratepayers to pay to desalt water for people and businesses in Marina and Ft. Ord. The PUC needs to require everyone to pay their fair share of the cost of the Regional Water Project, based on the amount of water they actually receive. Although the Cal-Am ratepayers are going to be expected to shoulder nearly the entire cost of the Regional Project, the current agreement gives them NO CONTROL WHATSOEVER over how it is run. Placing total control in the hands of an agency (the Marina Coast Water District) that has no incentive to hold costs down (its own costs are capped at $148 per acre foot, remember) is an obvious recipe for disaster. The PUC needs to ensure that a joint powers agency, or something similar, is set up to run the project in a way that ensures that those who are paying for the project have genuine control over it. The plan is to pump brackish water into the desal plant from an area near the beach where seawater is mixing with Salinas Valley groundwater. Since the law doesn’t allow Salinas Valley groundwater to be transported out of the basin, whatever proportion of the water pumped into the plant is deemed to be Salinas Valley groundwater must stay in the Marina Coast Water District (the Marina Coast Water District has gotten their service area declared part of the Salinas Valley groundwater basin). The proportion will be determined by the salinity of the water being produced by the wells. The less salty the water being pumped, the more water must remain in the Marina Coast District. This means that if the Regional Water Project is to achieve its purpose of replacing the water currently being illegally pumped from the Carmel River by Cal-Am, the water it pumps will need to be pretty salty. If it turns out to be less salty than is being assumed, the Cal-Am ratepayers will be paying to desalt even more water for Marina Water District customers and receiving even less themselves. The League of Women Voters, the Division of Ratepayer Advocates and others are calling on the PUC to require the Regional Project to drill slant wells toward the ocean to “minimize the risk of not meeting Cal-Am’s demand requirements …” Any Cal-Am ratepayers who care about their water rates and want to avoid future rationing ought to be joining in this request. For more information, including many other things about the current agreement that ought to be changed, check out this Executive Summary from the Division of Ratepayer Advocates, our previous post on this topic, this detailed article from the Monterey County Weekly and this fact sheet from LandWatch Monterey County. This entry was posted on Sunday, June 27th, 2010 at 10:17 pm and is filed under Carmel River, Politics, Water. You can follow any responses to this entry through the RSS 2.0 feed. You can leave a response, or trackback from your own site.